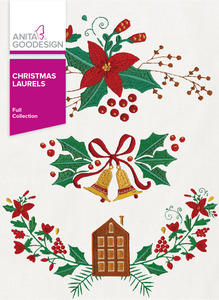 Deck the halls and the rest of your home this holiday season with our Christmas Laurels collection! For this collection we took traditional laurels and added our own personal touch to make them one-of-a-kind. Have all of your holiday guests dying to know where you got them from. This collection includes over 30 designs that you can use to decorate for the holidays, including isolated designs that can add a special holiday touch to everyday items. This collection also includes animals from our Anita’s Playhouse product line which are perfect for the little ones. These simple yet detailed designs are sure to be a hit this holiday season. 20 full designs in 3 sizes each with hoop sizes ranging from 5” x 7” to 8” x 12”.